Myanmar's Aung San Suu Kyi Confirms She's Running For Parliament : The Two-Way The opposition leader's run gives the country's reforms a shot of legitimacy. Suu Kyi, a Nobel laureate who spent 15 years under house arrest, had said she was concerned about how committed the military was to loosening its grip. 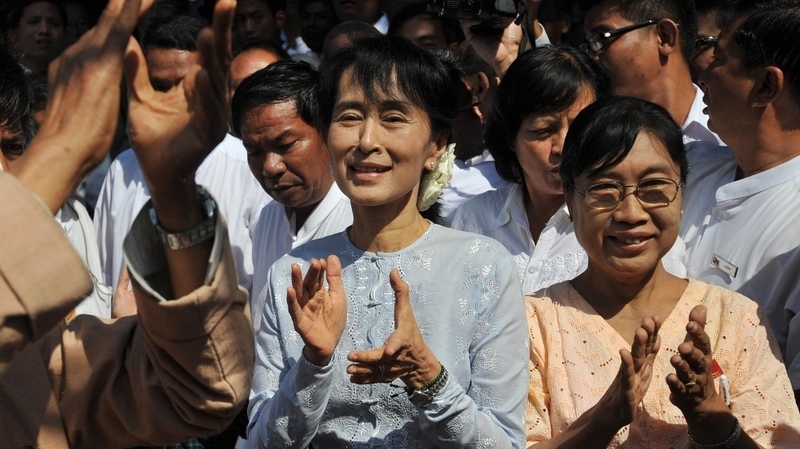 Myanmar democracy icon Aung San Suu Kyi, center, at an campaign event on Tuesday. Myanmar's upcoming special parliamentary elections just became more legitimate. Aung San Suu Kyi, a leading opposition figure in the country as well as a Nobel Peace Prize laureate, said she will mount a campaign for a seat in parliament. Myanmar is in the middle of a historic transformation. The military junta that ruled the country since 1962 with very little tolerance for dissent was dissolved last year. As we reported, Suu Kyi, who spent 15 years under house arrest, was encouraged enough by recent reforms that she urged the U.S. to send a diplomat. Back in December, Secretary of State Hilary Clinton became the first U.S. diplomat to visit the country, which is also known as Burma, in 50 years. As recently as last week, Suu Kyi declined to confirm whether she would personally contest a seat, telling The Associated Press in an interview that her decision would be announced later this month. She also expressed cautious optimism about the government's reforms. "I think there are obstacles, and there are some dangers that we have to look out for," Suu Kyi said. "I am concerned about how much support there is in the military for changes." Suu Kyi is planning to contest a seat representing a suburb of Yangon, which is Myanmar's largest city. The Wall Street Journal (paywall) warns that even if Suu Kyi manages a win at the polls, Parliament is still vastly controlled by politicians loyal to the ruling military. The opposition won't have a shot at truly disturbing that balance until a national election is held in 2015. "Ms. Suu Kyi's power 'will be severely limited,' said Aung Naing Oo, a Thailand-based political analyst who follows Myanmar affairs closely. "He said there are still some upsides to joining parliament, though. It will give Ms. Suu Kyi a bigger platform from which to argue for human rights, rule of law, and the release of hundreds of political prisoners in Myanmar. It might also lead to a more senior role in government, he said, if Ms. Suu Kyi is promoted to a ministerial position or other post with more power." The elections are scheduled for April.